Viacom are finally bringing the remaining series 19 episodes they have to TV screens! Well, five (out of seven) of them... in a special "Thomas Week"... Diesel's Ghostly Christmas won't be aired during that week, or any time in the near future, nor will this episode. 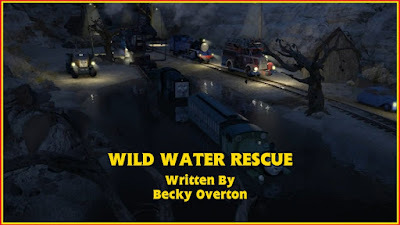 So, here are my thoughts on Wild Water Rescue. 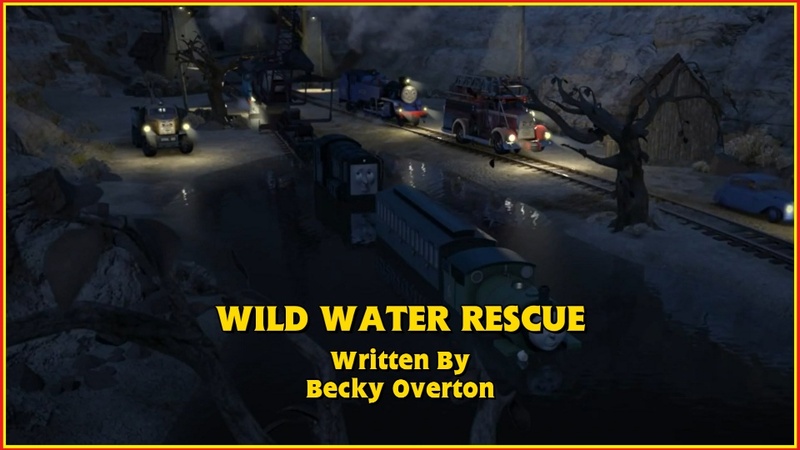 Despite her previous attempts, I think that Becky Overton is a good addition to the show's staff. Even though The Beast of Sodor was a rip-off that did little to distinguish itself from Henry Spots Trouble, she did try to add a few bits to try and make it feel fresh, and I probably would have been given it a better rating had it been discovered first. And although Diesel's Ghostly Christmas was hugely contrived, it was still a fun watch. With this episode, however, I think she proved what she can really do when given a bit of breathing space. First off, let's talk about Percy. Now I don't really want to dwell on characters that much in reviews any more as "getting them right" should be the default setting rather than a freak occurrence. But since Tale of the Brave and series 18, Percy has been brilliant. For the first time in about 17 years, he hasn't been treated like a wimpy idiot and more like a cheeky, naive youngster, like he was originally depicted in the first four series and in The Railway Series. And in this episode especially, he really shone. Partnering him up with Diesel was also a great move as they play off each other really well. Adding Thomas as the "go between" was fine as well; his more mature roles show how well he's grown as a character, too. The whole episode actually did feel character driven. The plot itself was nothing to write home about; some argument could be made that they mashed two plots together with the ceremony being the first part and finding Percy the second. But I was invested due to the strength of the characters, from Diesel's inability to apologise and admit the truth to Percy's reactions to being given the job originally and his thanking Diesel for the rescue. Also, it's nice to see the rescue team actually work as... well, a team, which is a rarity. How they've managed to hit 1,000 rescues due to their incompetence (oh, we'll get to that eventually..!) I'll never know, but there you go. That said, there are a couple of issues. First, it seems a bit far fetched (not impossible though, considering how convincing Diesel sounded) that Percy would believe that the mayor would have gone to an old quarry of all places. It could've been better if Percy had realised before reaching the flood that Diesel had tricked him and he had confronted him about it. I feel that could have had a stronger climax, especially if the confrontation happened just as the ceremony was wrapping up. Second, how did Diesel not know that water causes havoc with electrics? That's more a nitpick really as that scene was clearly there to bring karma on to him (and it's more an education for kids that water and electricity don't mix), but it's still a bit odd. #S19WildRescue Easily the best portrayal of Percy since season 6 or 7. It was also good to see some development for Diesel. Overall, this was Becky Overton's best effort so far. It's not as funny as The Beast of Sodor, but between that, this and Diesel's Ghostly Christmas, it has the most original and engaging plot. The characters play off each other well and the voice acting really sells it, too. DVD Reviews: Start Your Engines!